How about the size of *your* unit? I refer to the size of your wargames unit(s), of course. What, you were thinking of something else? No, I'm not talking about the size of the figures themselves (purists aside, for the sake of clarity, in this context we'll refer to that as "scale") , i.e. 6 mm vs 10 mm vs 15/18 mm vs 20 mm vs 25/28 mm, 40 mm etc., ad nauseum, but rather how many figures you use for each tabletop unit. Now, obviously the scale of the figures is going to impact this to a degree; 6 mm figures clearly look their best with a LOT of figures on each base, and thus many figures per unit. Similarly, really large figures like 40 mm or 54 mm, are likely going to have a relatively small number of figures per unit just due to their cost and the space they take up on the table (as well as in storage). So, for the sake of argument, I'm going to restrict further consideration to the "classic" wargaming scales ranging from 15mm to 30mm. Finally, we'll limit the bulk of the discussion to the era when the bulk of the men in the armies customarily fought in close order - more or less from Ancient times to say, roughly the Crimean War. This whole topic was triggered off by Wargamer Rabbit (aka Michael)'s comment about using small unit sizes in Napoleonic games, as his group does (1:100 ratio), and as Snappy Nappy calls for (although defined by bases rather than figures, it works out to about 1:700 for Infantry, and 1:350 for Cavalry, using 3/2 figures per base respectively). As the above implies, the rules that you use may influence the choice of unit sizes as well (and/or vice versa! ), some being quite prescriptive about theses things. 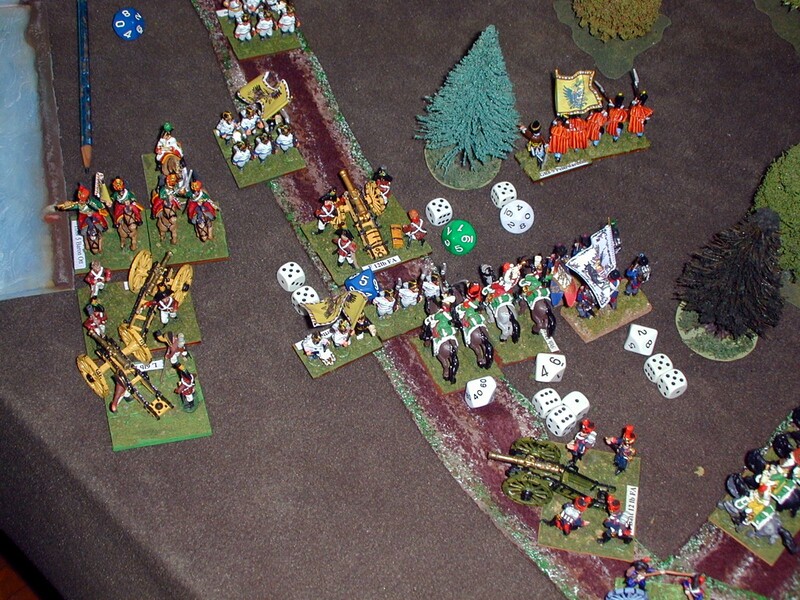 However, many modern rules sets work based upon the frontage of the unit, or the number of bases/"elements" per unit, leaving the individual gamer with considerable leeway regarding the number of actual figures employed. Perhaps somewhat curiously,. this is pretty independent of what a tabletop unit is representing - a battalion, regiment, brigade or what have you. "Black Powder" and the related/derivative sets like Hail Caesar! just define units in general terms, such as very small, small, average, and large, leaving it to the individual gamer(s) to define exactly how that translates into figure numbers for *their* tabletop. 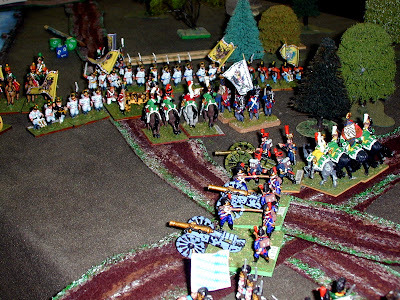 Over the course of my almost 45 years in the hobby, I have used units that were very small (3-6 figures, for example Snappy Nappy, and a few trials of DBX) and some that were very large (for example, Gush's Renaissance rules, and Pike Blocks in my own Band of Brothers rules), as well as many intermediate sizes. 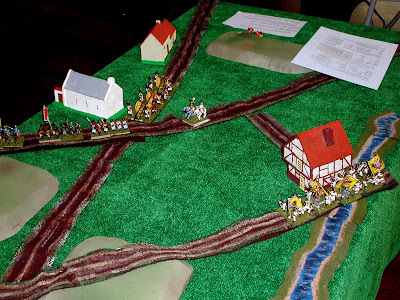 As I stated to write up this post , it rapidly took on a life of its own as a sort meandering exploration of my own personal wargames history, and rules that I have known and loved (or otherwise), seen in part through the lens of the sizes of the units we field for the tabletop (and the question as to "Historical Organizations" or not). I''l stat the ball rolling with a few pictures of my biggest unit, and then pick up the personal history in a subsequent post. Now, I realize there is a certain amount of narcissism involved in such a project, but hey - blogging itself has a pretty strong narcissistic element anyway, no? A sixteen stand Swiss Pike Block. Sixty four figures in all. That's a lot of pointy things! PS: smallest unit - Napoleonic Sappers, one stand of 2 figures. If you follow the wargames Blogosphere, you've doubtless been noticing the appearance of this award in our circles. 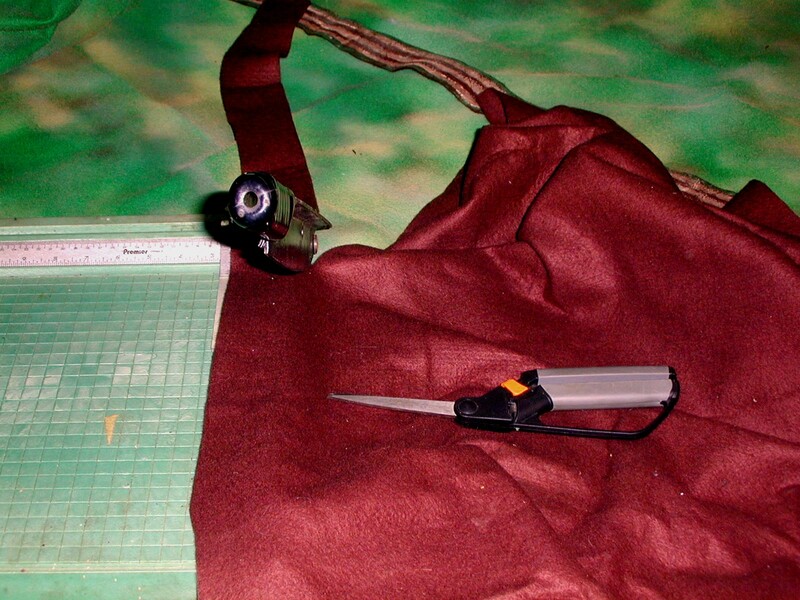 Garry at Sgt Steiner's blog was kind enough to nominate "Blunders" for this honor. Gary's blog is always fun to read, and lately he's been doing some miniatures gaming again as well as all those boardgames! :-) Thanks, Garry! Copy and paste the award on your Blog linking it to the blogger who has given it to you. List your nominations (complete with links) on your own Blog. Sit back and bask in that warm fuzzy feeling that comes with knowing that you have just made someone's day! 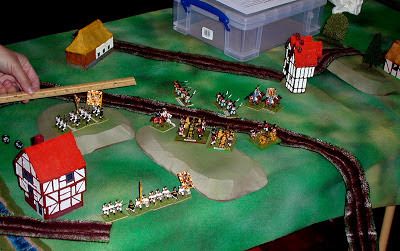 1) As Garry has already nominated Brent Oman's Blog, I certainly have to nominate Dave M's Santa Clarita Wargamer blog. His painting is excellent, as are his battle reports, and his enthusiasm for all thing Piquet is almost as infectious as his enjoyment of alcoholic beverages at conventions. :-) Well deserved, Dave! Skoal! 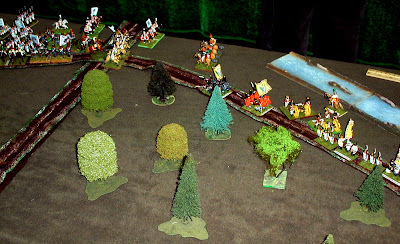 2) Dartfrog's Adventures in 6mm While I am not a fan of 6mm figures personally, his posts are interesting, especially his recent ones on converting Samuari Battles (a C&C variant) for the tabletop. My absolute favorite posts, though are the series of games he ran for his six year old son for Halloween, pitting King Mason and his troops against the Forces of Darkness. If we were all this good and creative at involving our children in our hobby, we would never have to talk about it "graying" again! A tip of the bicorne to you! 3) Wargamer Rabbit's Blog Michael's (aka WR) blog doesn't show on my blog roll, simply because it is a wordpress site and thus I can't "follow" it via Google. 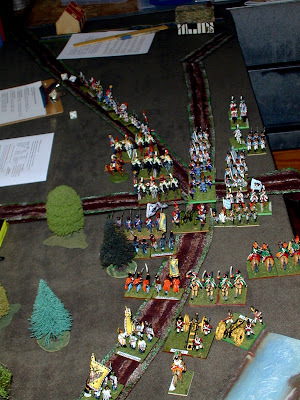 WR is roughly of my generation, and speaking of involving your son, his young adult son, Daniel, is being taught the ropes of Napoleonic command as told in the recent battle reports. 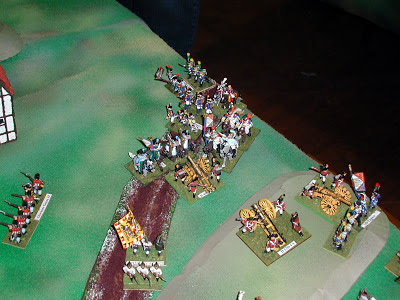 WR has started working his way through the battles of Napoleon's first Italian campaign. I can't wait for more of his scenarios and battle reports. Besides, I think Michael may have more old 25mm Minifigs in his Napoleonic collection than I do! Highly recommended. 4) Super Galactic Dreadnought Desert Scribe's blog which focuses on Science Fiction and Fantasy gaming. Although my primary interest is Historical gaming, I share his love of the Superior Starfleet Wars ships. Now as a physician, I should hold his being an attorney against him, but hey, mys sister is one too. Some times it happens to the best of us! Anyway, his blog got my starships back on the table, and some long unpainted ones are being completed. Thanks! 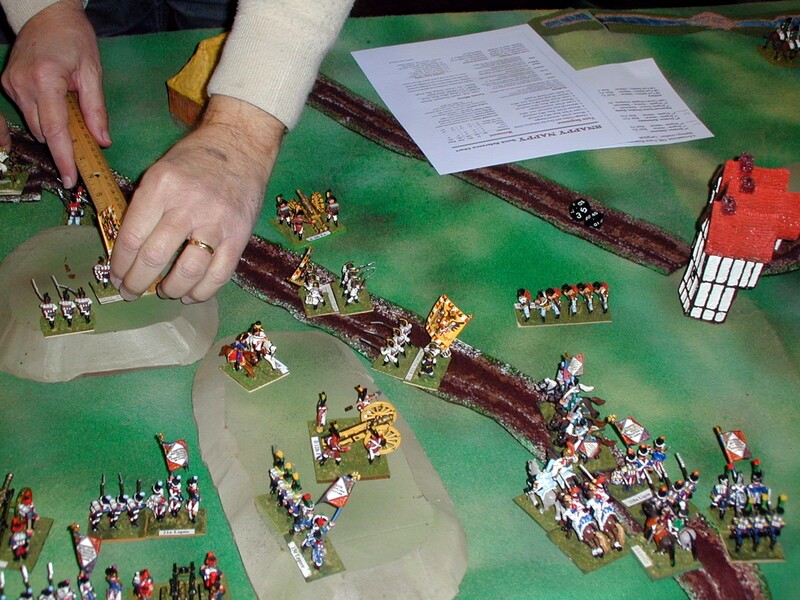 5) Wargaming in 28mm (and sometimes smaller) John's excellent blog, largely but not exclusively Napoleonic in focus. 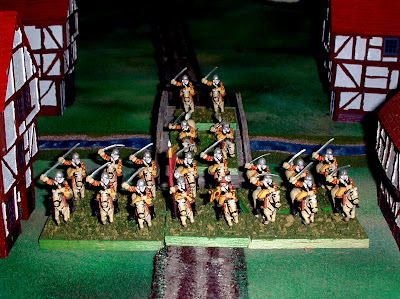 Although John has posted a great many of pics his units to his blog, I have far more myself. Only problem is, his are much better painted! :-) John's posts are always well written and interesting. 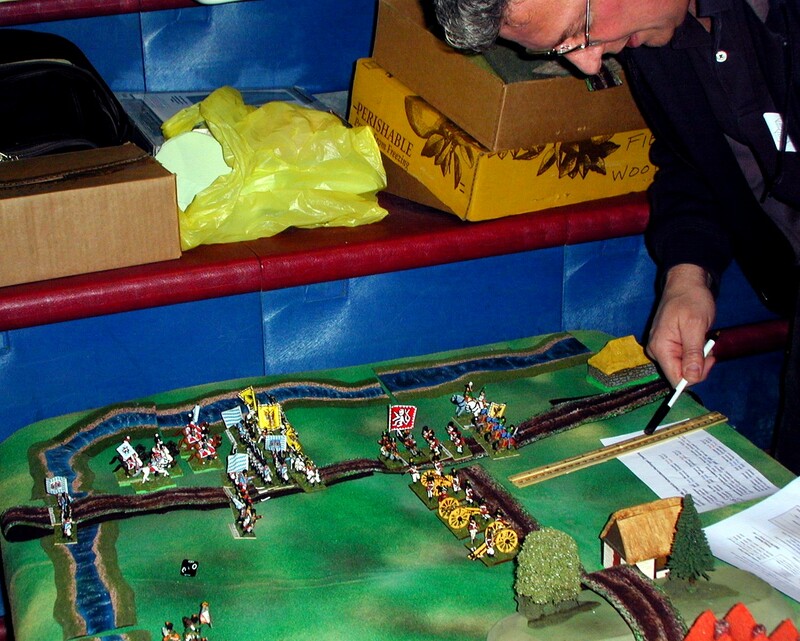 That aside, he's a fellow physician, and there aren't too many of us Doctor-Wargamers out there. Well done, John! As part of the process of planning for the "Campaign in a Day" we ran at Ellis Con last weekend, and in preparation for the bigger 1813 Campaign in a Day planned for the Spring of 2013, I decided that I might need more roads form my tables. Now, I have a nice set of the old Editions Brokaw "Flex Terrain" roads, and have augmented them with quite a few additional 2" roads from one of the current manufacturers of Latex roads (can't recall who I used). Painted they look very nice, buit even with the large sets I have, just not enough. 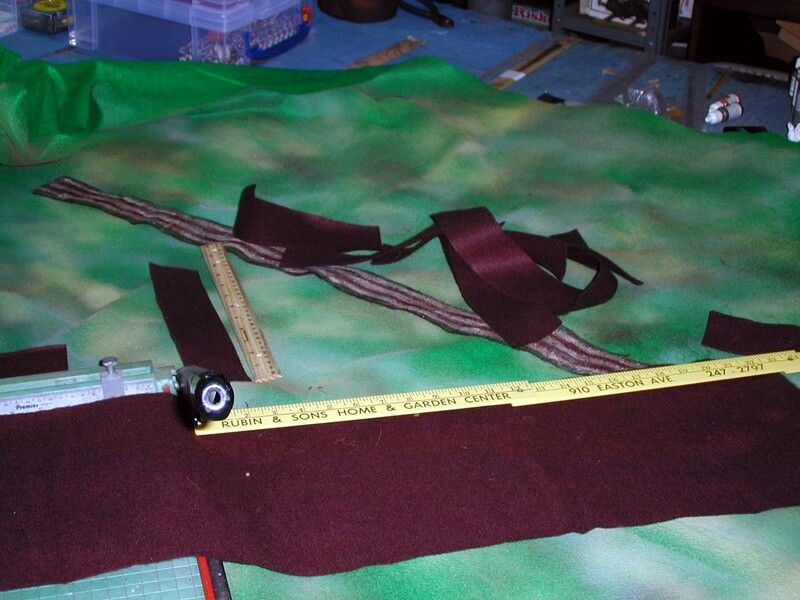 Maybe 4 years ago, in preparation for our 1809 Historicon 2009 project, I made a set of 6 foot long roads out of dark brown felt, intended especially for the Wagram battlefield. They have come in handy many times since then. I still had a sizeable piece of the same felt left over, depicted below, about 6 feet x 2.5 feet. 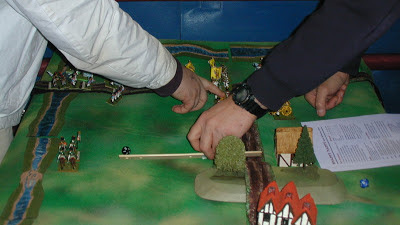 One of the roads from the original set is depicted alongside. 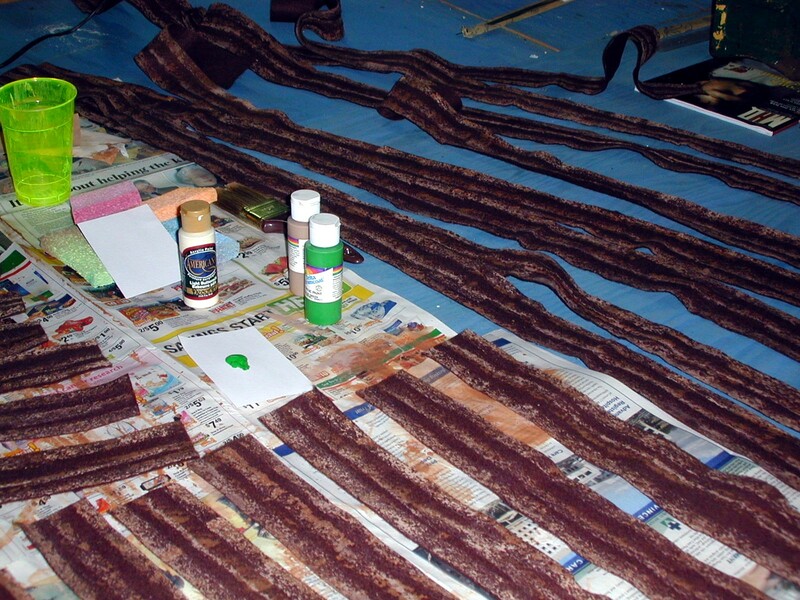 That was painted with the same specially formulated paints sold for use on the original Flex Terrain; alas, those finally dried up in the interim, so I could exactly replicate the colors or the technique - plus I needed these roads ready quickly! 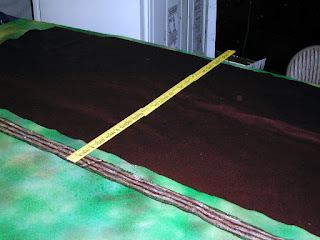 A large piece of dark brown Felt, and one of the old roads previously made from the same felt. and some about 24" long as seen here. 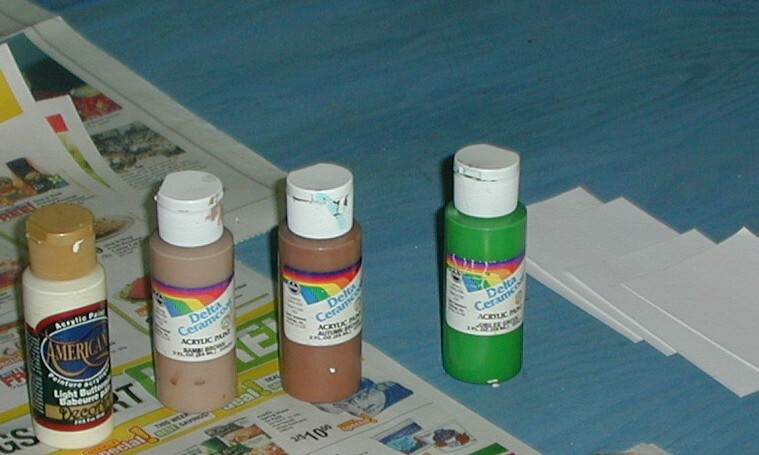 As mentioned above, the paint I used for my first set was neither usable nor still available, so I tapped by extensive collection of craft paints, and wound up selecting Delta CC Autumn Brown, CC Bambi Brown, CC Green, and Americana Light Buttermilk for the project. The idea with painting the 2" wide felt strips was to do it almost like a "layer cake", with the two dark brown stripes of (mostly) the base felt representing the wheel ruts. 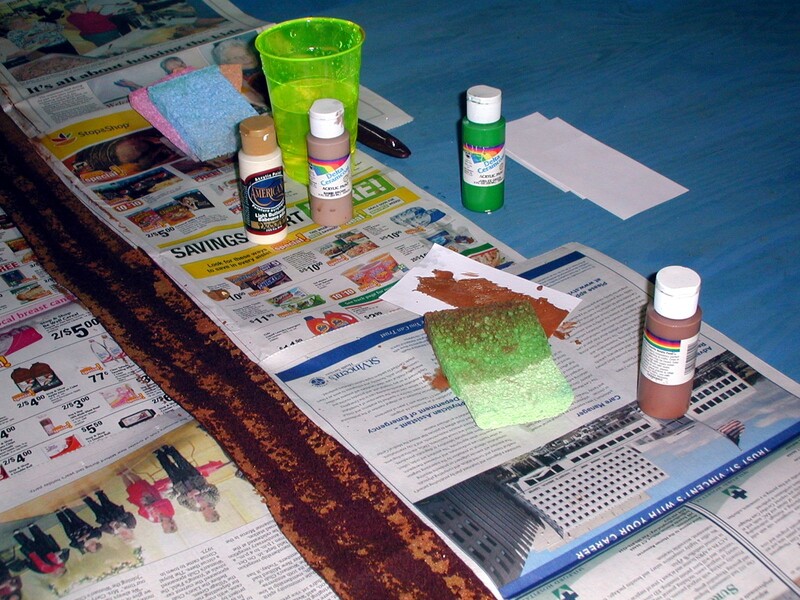 I have applied three "stripes" of the Autumn Brown, using the short edge of a (clean) kitchen type sponge, and thining the paint somewhat with tap water, then pressing the sponge to the felt rather like a rubber stamp. 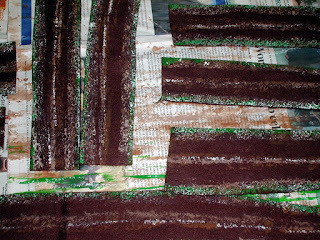 Quick, and gives a more "realistic", mottled look as seen on the sample above. About an hour later, all roughly 80 feet of roads have had the Autumn Brown stripes applied. They were allowed to dry until I was ready to continue the next night. Next up is the lighter, CC "Bambi Brown", applied in the same fashion on top of the first stripes, but lighter, leaving a fair amount of the darker "Autumn Brown" showing. I used the beveled edge of the short end of the sponge a lot to get narrower lines of the lighter brown applied. 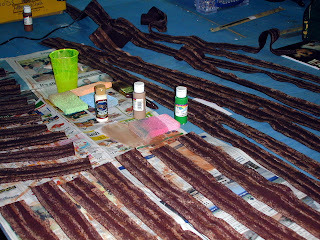 Once again, this took about an hour, and then I allowed the paint to dry overnight. 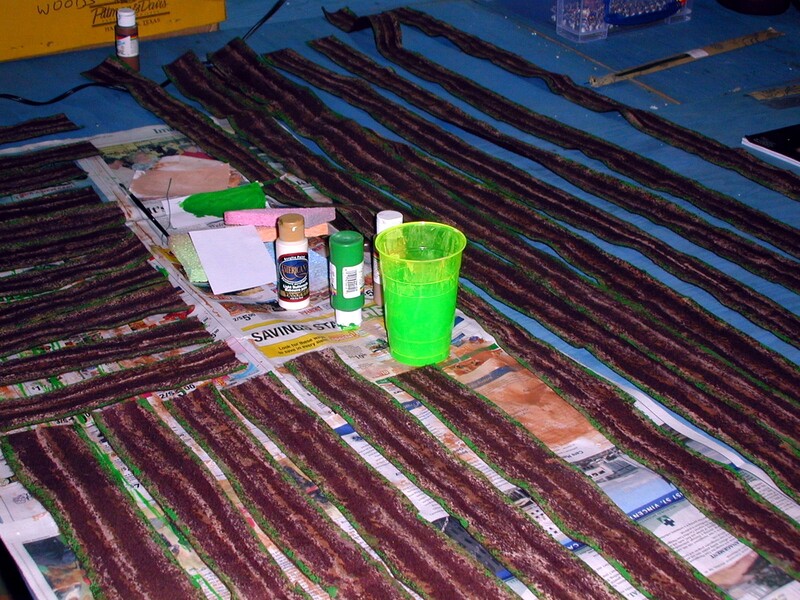 Now it is time to add the CC "Jubilee Green" This is applied over the two outer stripes, but not the middle one. 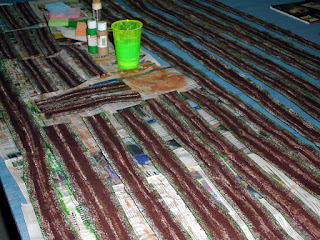 Actually again using the sponge technique, I tried to apply the green to roughly the outer half of each of the outer stripes, simulating grass growing along the edge of the road (and also blending better when laid upon with the green felt tabletop). Glue and flocking could of course be used instead for this step, but when done with paint alone, the roads are all but indestructible! 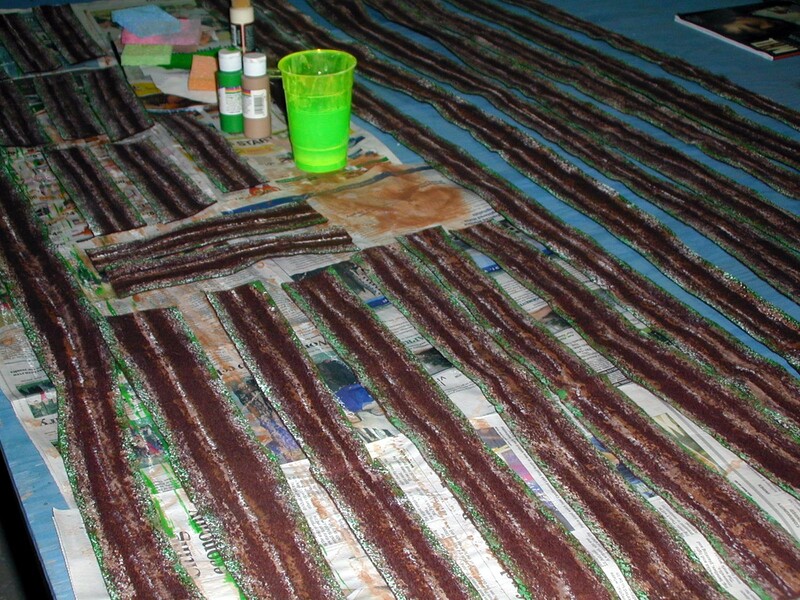 Here's the set of roads with the Green applied to the edges. Once again, the paint was allowed to dry for a day or so before doing the next step. The final color is the Americana "Light Buttermilk", a slightly off white/light tan color. 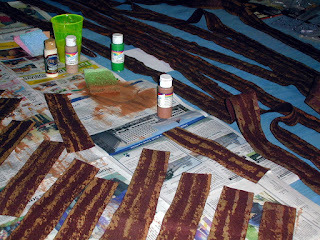 If I did it again, I might use regular Buttermilk, which is just a bit more tan in color. 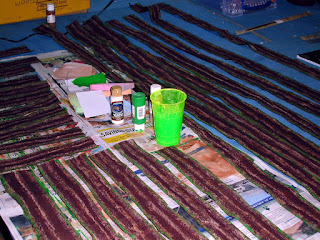 This paint is quite thick, which is what I wanted, as it will be applied in a much lighter "stamp pattern" over all three stripes - on the central stamp I mostly used the beveled edge of the sponge (held at a roughly 45 degree angle to the felt) to do a more narrow pattern there, while using the full short edge of the sponge on the outer stripes. And here is a close up of the final results. Quite presentable looking, I think, and it took roughly 6 hours of work and perhaps $25 of materials to make 80 feet of roads - not bad! 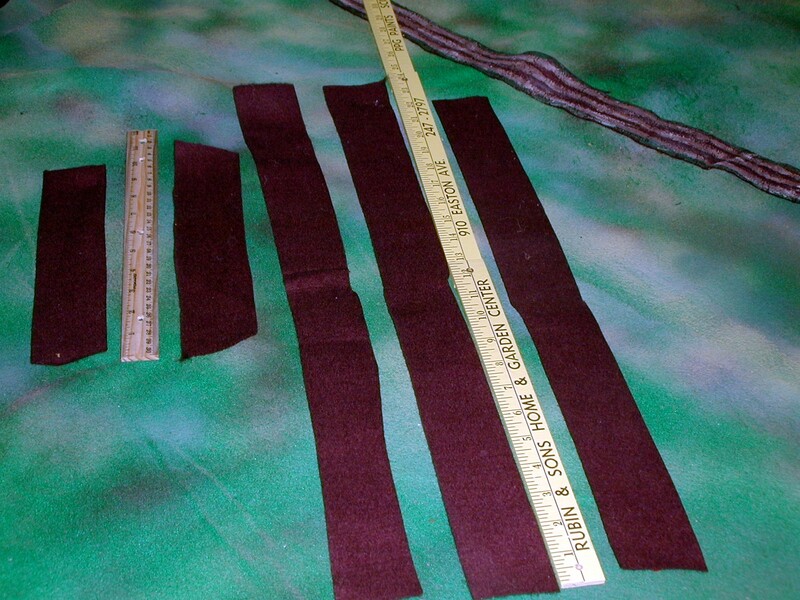 So, if you're looking for some quick, cheap, easy roads that are a step up from plain strips of felt or paper, try out this method for your own table! "The road goes ever, ever on...."
While certainly the members of the Parliamentarian faction had a variety of reasons for opposing the king, a large sub group of them was the Puritans, well know to us in America as the settlers of the Plymouth Plantation in Massachusetts in 1620, more than 20 years before the beginning of the English Civil War. 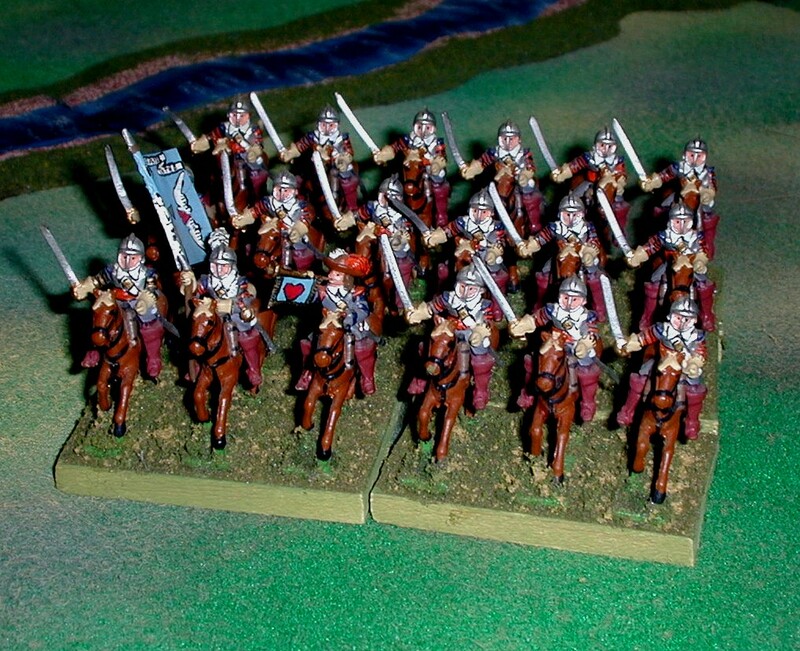 Thus Thanksgiving Day is certainly an appropriate occasion for my next post regarding my parliamentarian troops, this time the first group of my Roundhead cavalry. 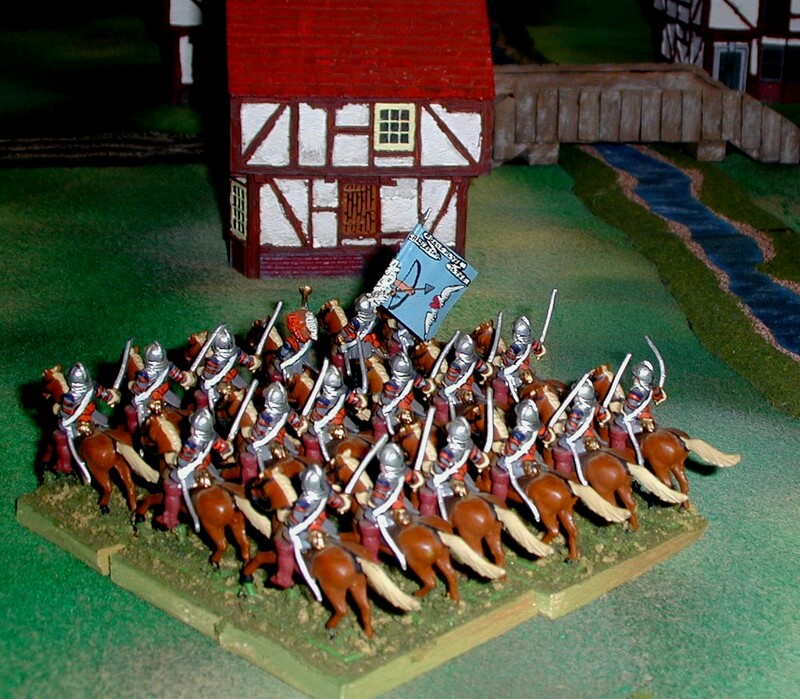 Once again consisting of vintage Minifiigs from the m,id 1970's this 20 man strong unit is Alexander Popham's Regiment of Horse. The costume is based upon the illustration in the Almark book non The English Civil War by R. Potter and G. A. Embleton, published in London in 1973. I have jazzed up their yellow/buff coats with red "rings" on the sleeves, a common form of embellishment in this era. The flag bears the motto "Cave Adsum", which more or less means "Beware; I am here!" and is the motto of a Scottish clan, among others. 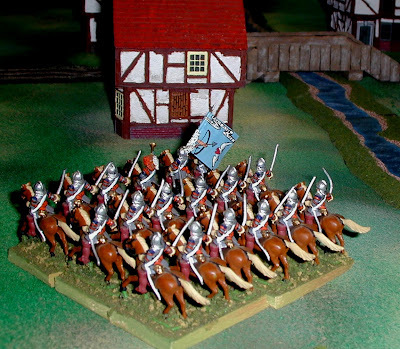 It has been so long ago that I painted these guys that I have no idea if the flag is properly associated with this unit, but I suspect not! 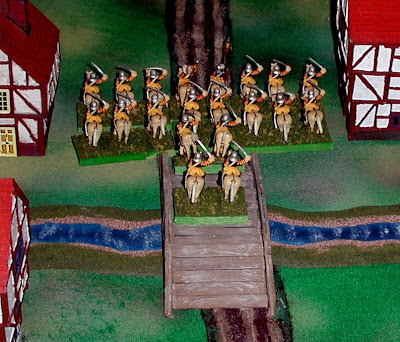 A rear view of the Regiment deploying into line after crossing a bridge; the back and breast plates are blackened, which makes a nice contrast with the yellow coats! This next regiment is the Earl of Denbigh's Regiment of Horse, sporting more somber grey coats. Unlike the rather stylized designs of the Infantry flags, Cavalry flags during the English Civil War were often most akin to political cartoons! This one has the scroll inscribed: "Charles thus Peace Flyes to The" (spelling was not yet standardized in the 1600's! ); once again I am unsure this particular flag is properly associated with this specific unit. 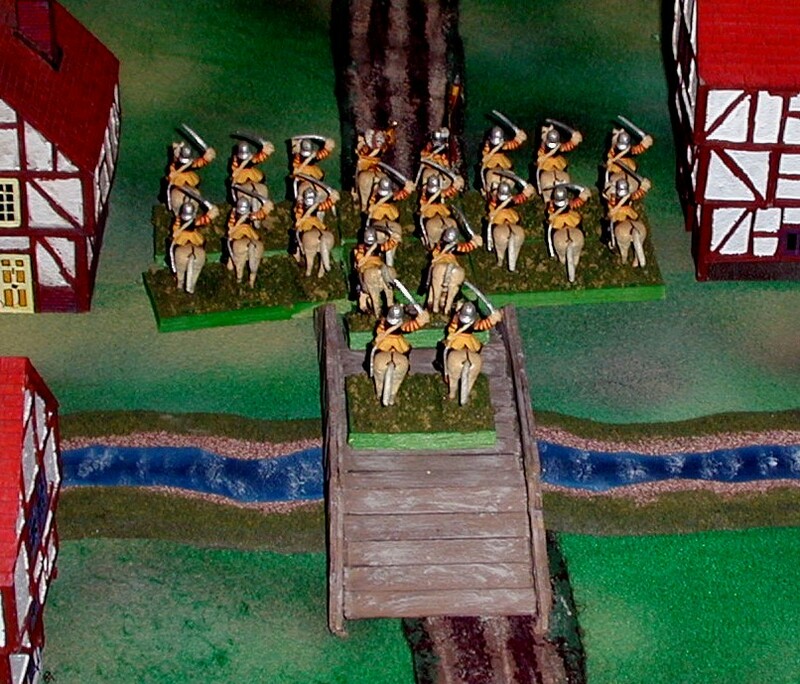 The Earl's regiment is based as Trotters, favoring the use of the Pistol. 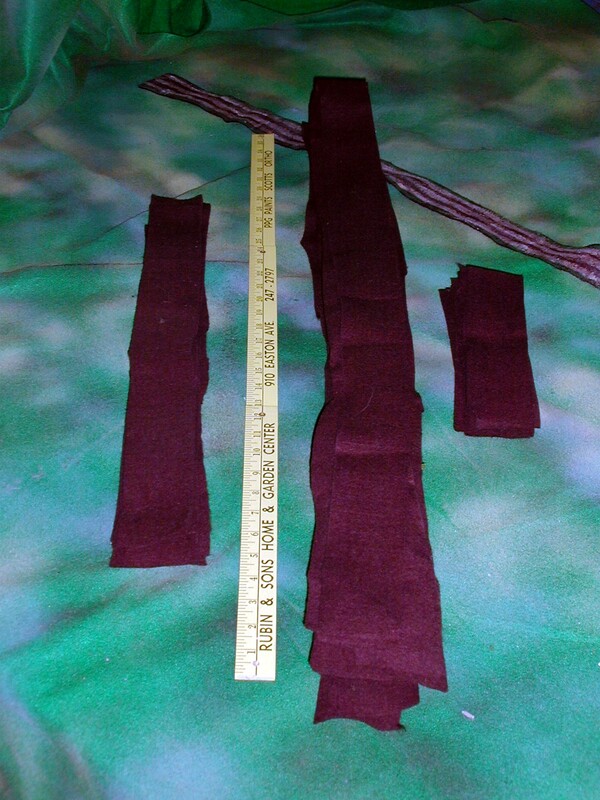 Their coats are adorned with orange-tawney rings on the sleeves, as well as sashes of the same color. A very happy and blessed Thanksgiving to all my American readers. As for the rest of you, I am always thankful for your readership and participation here! So, last Saturday morning dawned cold and clear; I was up at 7AM so as to be sure to leave by 8AM and arrive in Danielson for Ellis Con shortly before 10AM. As usual, I was up until about 2AM pulling the troops and packing them, plus way more terrain than I ultimately needed. Unfortunately, personal issues forced Joe to cancel at the last minute, and we already knew that Barry and Greg would be unavailable (although Barry and I think Greg contributed some terrain and especially much needed table cloths. That left James, Thomas, and I as principals I figured we would most likely have to contend with less table space than we really needed, and probably a less than a full complement of players. 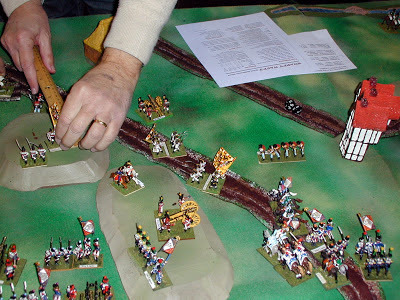 Still, this was intended both to be fun game in and of itself, and to be test run of the "Campaign in a Day" concept for a planned big 1813 bash in March or April 2013. As the old saying goes, and James observed on the day, "No plan survives contact with the enemy" (or gamers!). James and his wife assembled a slew of printed cardboard buildings, and he also had the overall map printed out at Staples on an 18x24" sheet of laminated paper, and deleting the green background, which was a big help setting up the terrain and getting the overall situation straight; thanks, James! The first surprise was arriving at the Ellis Technical school - the entrance to the Aircraft Hanger had been dramatically and beautifully transformed, part of a major renovation of the school by the Sate of CT. Said hangar is now a beautiful but not quite finished new gymnasium.... so this year Ellis Con was held in the *old* gym; I was told this is slated for compete revision/demolition starting next week. The heat seemed to be off in this part of the building, although the Simulation Club used the big aircraft fans to try to blow warm air into the gym; still, it was at best 55-60 degrees inside, so we all kept our jackets *on*. 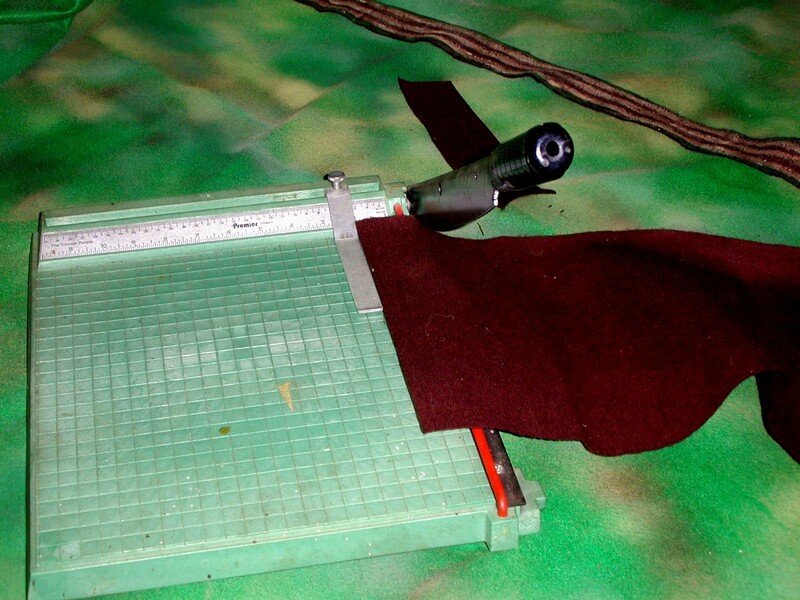 The gym is smaller than the hangar, and the partitions that used to divide the far end of the hangar into smaller spaces don't exist in the gym, so that meant the tables would obviously be in plain sight for all, thus eliminating a good part of that aspect of the "fog of war". I brought three tables along myself, and the Convention gave us 8-9, so between a somewhat limited space to work with, and about 30-40% less table square footage than ideal (a fully anticipated difficulty) we had to improvise the table set ups to maintain the overall geometry, while abstracting the layouts to fit the available tables. Still, James, Thomas, and I, with help from Matthew, set to work arranging the tables with relation to one another, and then "dressing" them with terrain. We finished setting it all up about 11:30AM and after a short lunch break (the kitchen is also being renovated, so in place of the usual good, inexpensive hot food, they had good inexpensive cold grinders, chips and soda for sale), started the game shortly after 12 Noon. For players, we had myself, Thomas, James, Matthew, Brian and ? Charles; Pete dropped by after a while and seemed interested so we added him to the game. Forgive me any of the mixed up any names I've doubtless been guilty of! With a small number of players, it was clear that having an overall C-in-C for each wasn't really practical, so we decided to just have at it and give the Snappy Nappy rules a thorough run, including inter table movement. On the French side were Matthew (Davout), James (Lannes) and myself (Lefebvre's Bavarians); on the Austrian side were Thomas (Hohenzollern-Hechingen), ? Charles (Rosenburg), Brian (Ludwig), and later Pete (Liechtenstein's Reserve Korps). Towards the end of the game another interested fellow dropped by, and I handed off my Bavarians to him. We didn't use Massena, or Vandamme on the French side, or Hilller, Belegarde, or Kolowrath on the Austrian side, although I did require Davout to leave behind two Infantry Brigades in Regensburg in recognition of the Austrian threat there. This meant that tables A, B, and D were not needed at all, and several others were hardly used, although we had set them all up up (the number of players was unknown until the game got under way). I was the only one who had played Snappy Nappy (hereafter "SN") before, and that was 4 years ago; James had read through the rules pretty thoroughly, but no one else was really familiar with them at all. Thus we kept things simple, and were very liberal with orders changes for each Corps. Despite this, and although we doubtless made numerous errors, we all found the rules exceptionally easy to pick up once the key concepts were grasped. 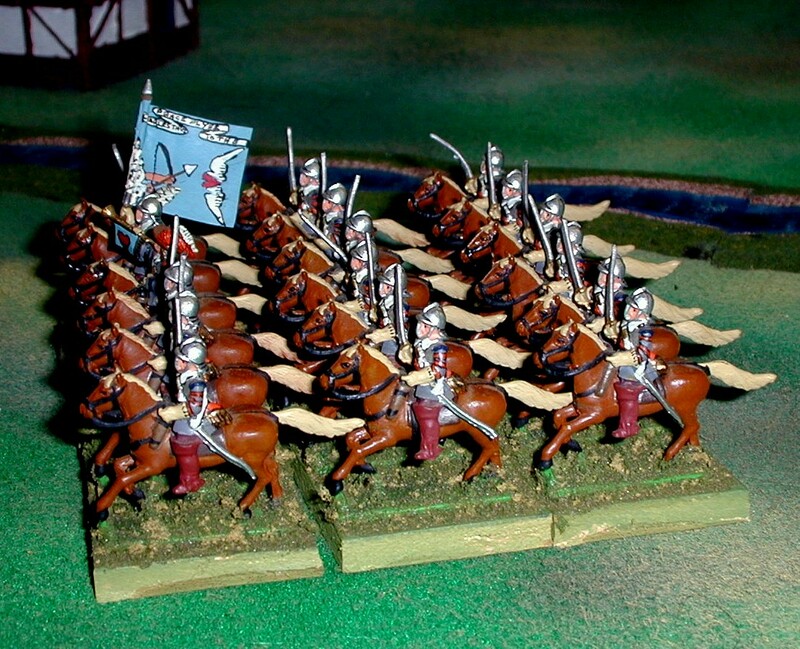 Allowing for the large scale of the game (an infantry "unit" has 2 stands, each representing about 2,000 men, so a unit is roughly a brigade in size! ), and some necessary abstraction, the results of combat were always plausible, and the play flowed smoothly. 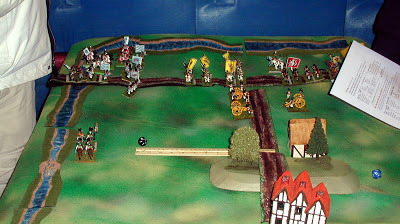 Indeed, all of the players were impressed that SN did very well at fulfilling the author's (Russ Lockwood) promise of "Simple, subtle, and ultra-fast rules for miniature wargames in the Napoleonic Era", even to the extent that they'd consider the rules for short one on one "pickup" type games. 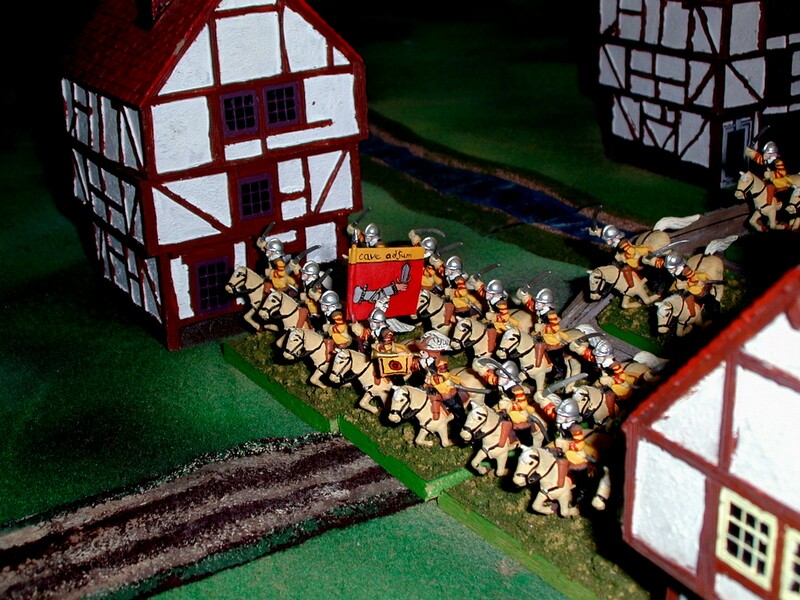 Although we used my 25/28mm troops, at this scale an entire Corps has less than 100 figures, well within anyone's ability to collect using any figure size. Snappy Nappy is available from On Military Matters. The link also has still more information about the rules; the price is a quite reasonable $29/copy. 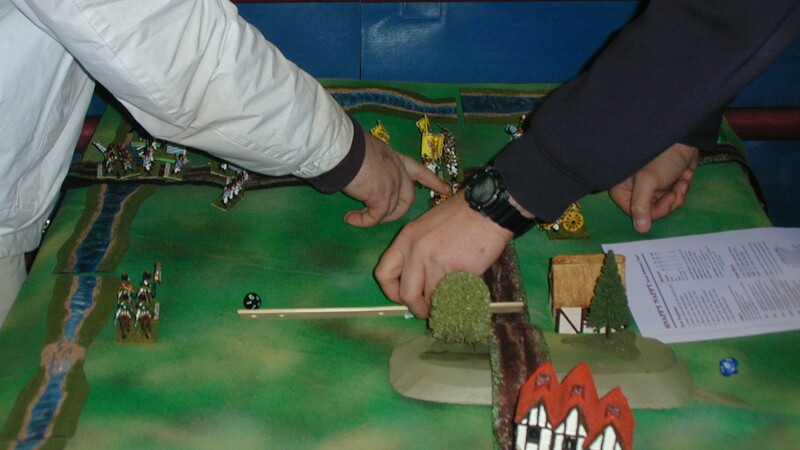 Action on Table "C" (between the Ilm and the Abens - The Abens also runs along the table edge above the visible river section). Lefebvre's Bavarians (me) and Lannes' French/Rhine Princes troops (James) have seized the crossroads, and with it control access to the bridge over the Abens at Abensburg. Ludwig's Korps is marching forward at all speed to make the passage contested, and (hopefully) allow sufficient time for the rest of the Kaiserlicks to crush Davout before our troops can intervene. 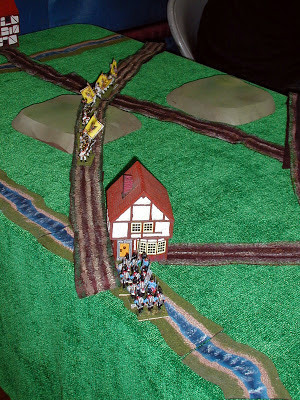 Hohenzollern-Hechingen's Corps (Thomas) is traversing table E (Abensburg) at all speed, moving to support Rosenburg on table F.
On Table F, Rosenburg (Charles) has passed through Eggmuhl and is headed towards Dinzling and Teugen. Meanwhile, Davout (Matthew) on table G has set out from Regensburg (fortified town in the distance, straddling the Danube) with all haste, seeking to link up with the rest of the French army before the White Menace can destroy his powerful but isolated Corps! 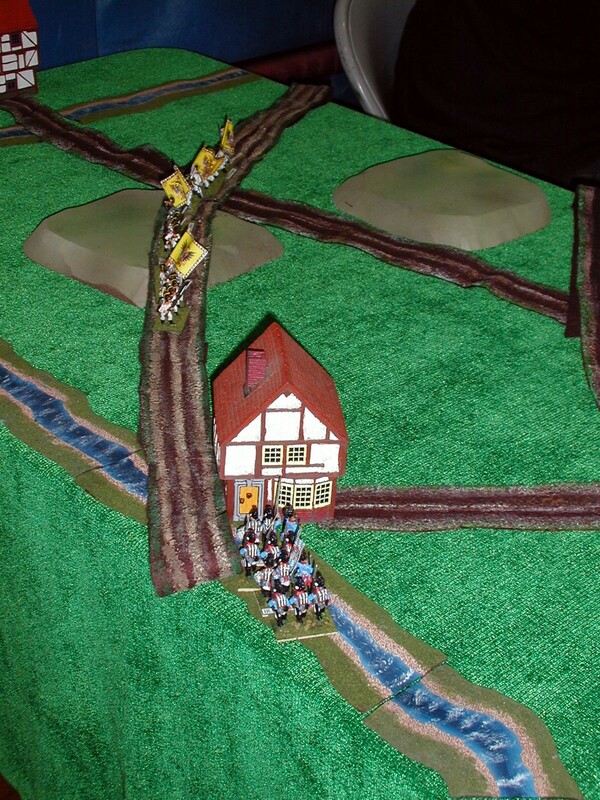 Liechtenstein's Reserve Corps (Pete) has started on the march from its starting point near Pfaffenhausen on table "H", aiming to cross the Gross Laber onto table F at Eggmuhl. In the background behind him are (unused) tables D and B.
Circa Turn 3 on Table C; an impetuous charge by my Bavarian Dragoons was shrugged off by the Austrian Hussars, but I have established my 12# battery and Jagers firmly astride the crucial crossroads. Lannes has put his best infantry unit in the front, supported by three units of French Cuirassiers. View from the Austrian side of Table C at about the same time. Meanwhile, the bulk of Hohenzollern's Corps has crossed onto Table F near Hausen. Taking advantage of control of the crossroads and the bridge over the Abens, Bavarian Infantry has crossed onto Table E at Abensburg, chasing the Kaiserlicks to the Feking Bach stream which runs along the opposite edge of the table. 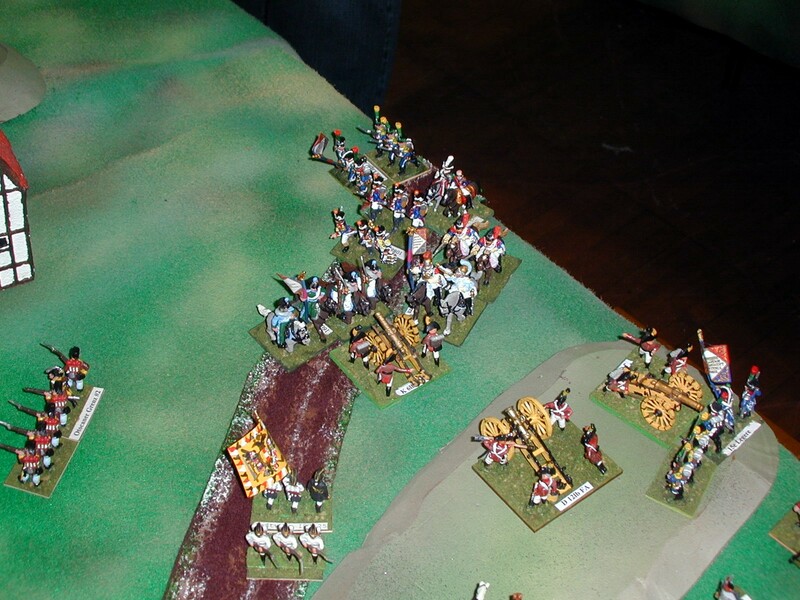 Liechtenstein's Grenadiers, Cuirassiers, and artillery prepare to cross the Gross Laber onto table F as well! 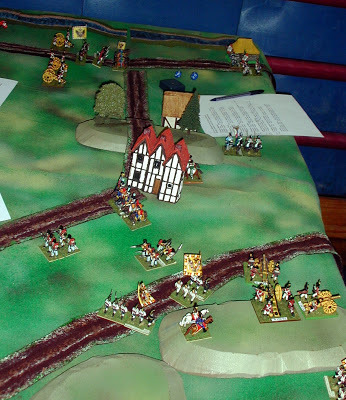 and on the other side of the woods on Table G, preparing to attack across all three roads is Davout! 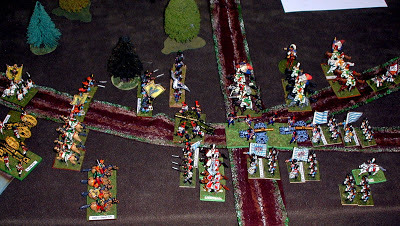 Combat on Table C; my 12# is about tom inflict serious damage on the still limbered Austrian 6# battery, Lannes' infantry and Cuirassiers have launched successful charges non some Austrian Line and Grenz. For this rather complicated conflict, the small D6's are the sum of the modifiers for each stand, and the D10 is the random roll for that stand, which added to the factors and compared to the same as calculated for the enemy, determines the difference and melee results. 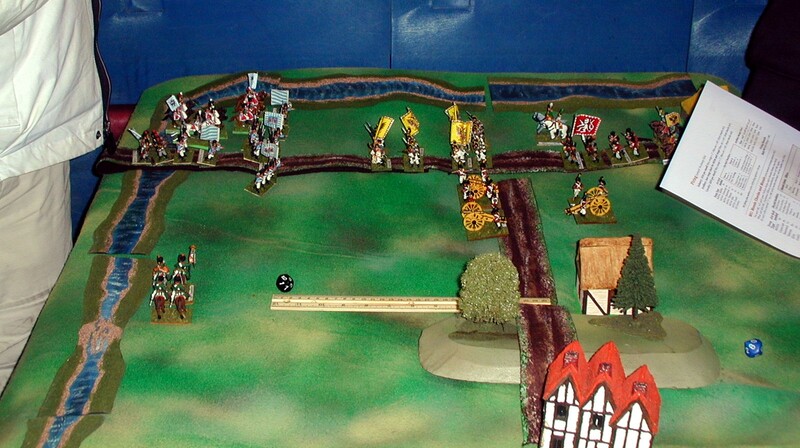 All "losses in SN are declines in Morale status; these losses are quite difficult to rally off, and if the unit declines to "Rout", it is removed from play. Intermediate levels have various effects upon combat, and some cause mandatory (and immediate) retreats. but then Davout's troops (Matthew) charge onto the table near Dunzling! 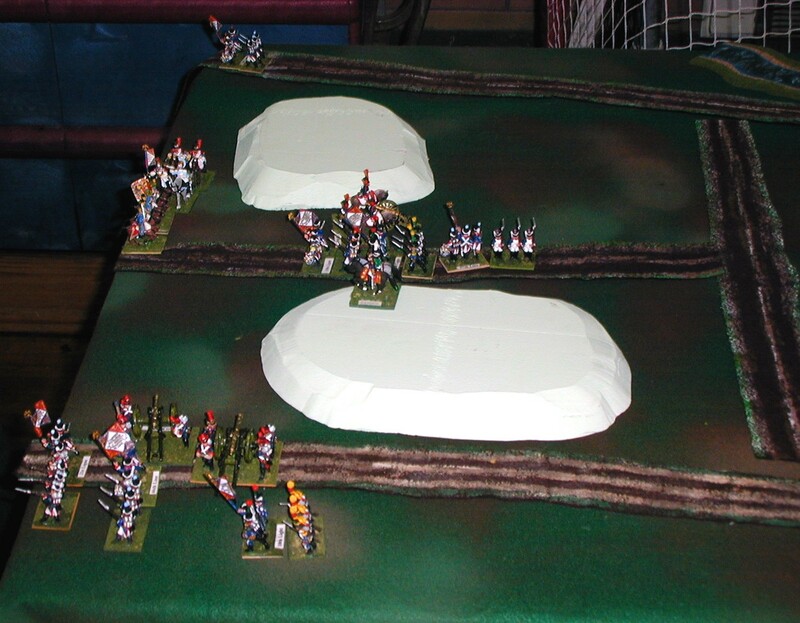 That battery being charged from the flank and front by Cuirassiers and Chassseurs doesn't look very happy! My three artillery units (representing about 72 guns!) 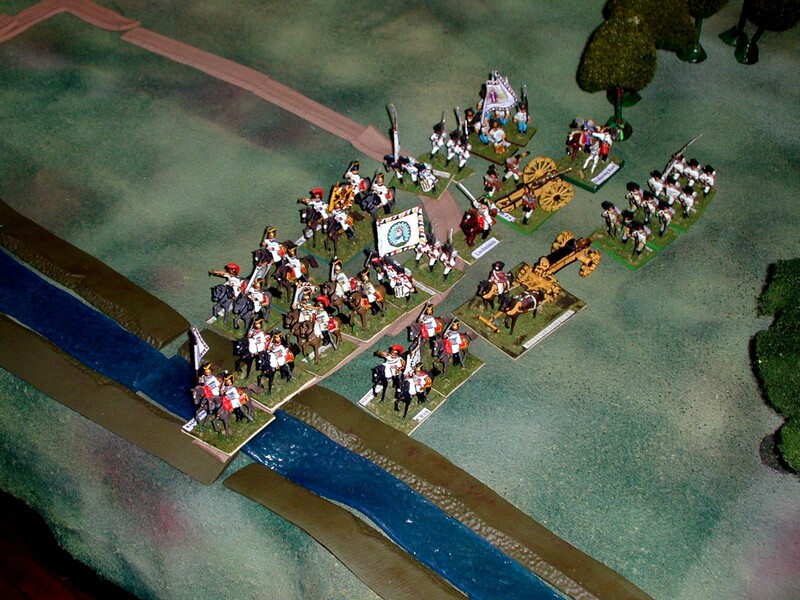 dominate the crossroads on Table C, and have driven off the second Austrian 6#er, while James' cavalry attempts to ride down the Austrian infantry. 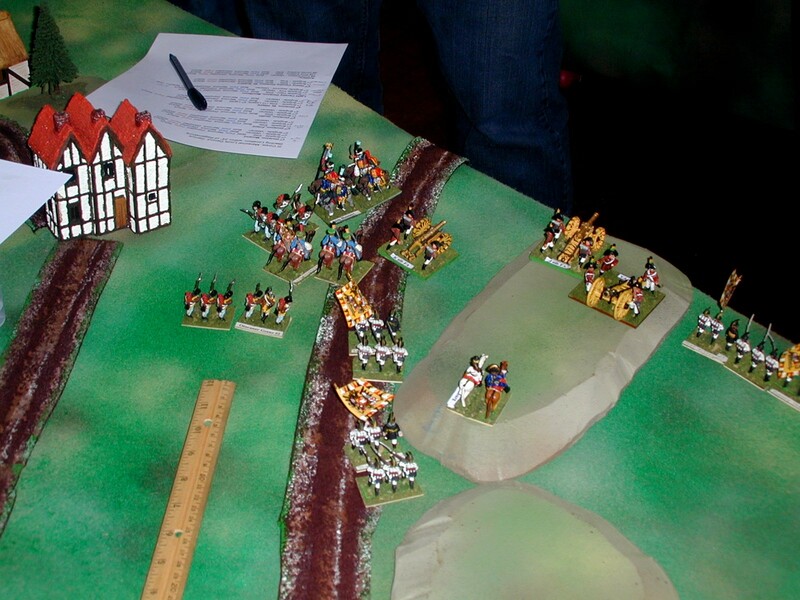 Still, my Bavarian Infantry is going to need artillery support if it is to be successful two tables away on Table F! with Liechtenstein's Grenadiers and artillery soon to follow! Davout expands upon his initial success near Dunzling and Hausen. Bavarian Infantry arrive on the Northern end of Table F, hot on the heels of Hohenzollern's Austrians (Thomas). 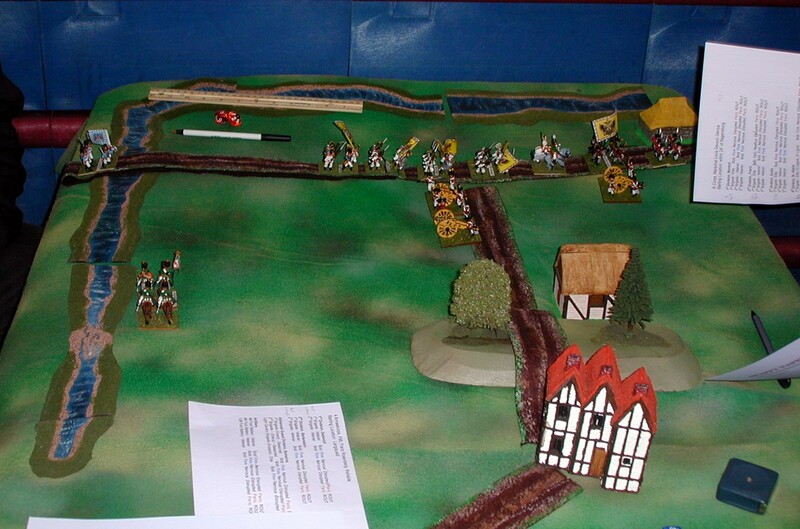 And still more Bavarian Infantry arrive; Thomas has turned his three artillery units to discourage them. 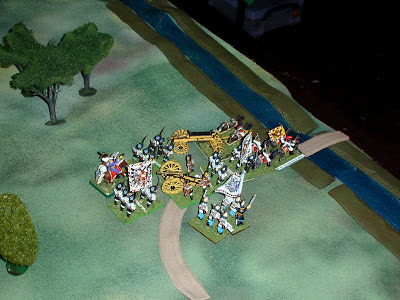 "Where then is our own artillery, Monsieur le Marechal?" New Guy takes over the Bavarians on Table F, as he and Thomas discuss combat resolution. The growing mass of Bavarians has cause Hohenzollern to do an about face with most of his Korps to counter the threat to his rear! 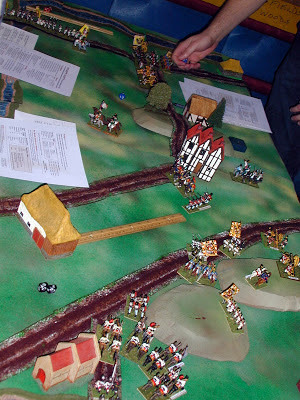 Bavarian infantry moves to the attack, as Thomas checks his Austrian roster sheet. 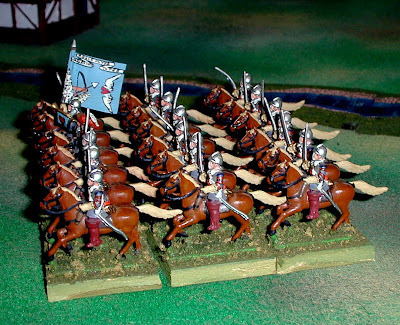 The Bavarian cavalry is in reserve... but where are their Guns? Shortly thereafter we called the game; we had reached our scheduled stop time of 5 PM, and it was clear that Davout would not be able to drive through the Austrians, and the Bavarian attacks failed to make more than limited headway. Thus, the Austrian players outperformed their historical counterparts, and have prevented the French army from reuniting... so far!. 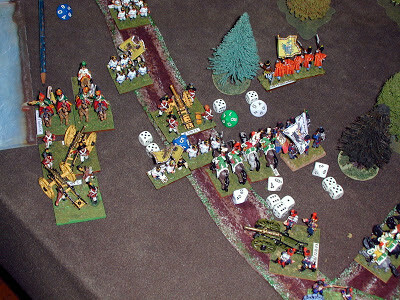 Corps without arrows had no players and thus did not move. 1) Snappy Nappy was easy to learn and play, and gave an enjoyable and plausible game. It is well suited to this sort of project, but not limited to it. 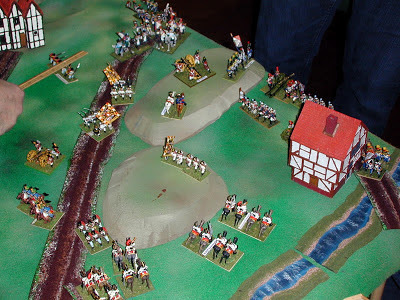 2) We were definitely encouraged to proceed with planning for the "Full Monty" 1813 project. 3) Next time I will design the overall map with the exact tables available known and accommodating them, rather than trying to do it the other way around. 4) Although the maps generated with Battle Chronicler looked great, the red on green text (town/village names) is hard to read on printouts - back to MS Paint and white background next time, I think. 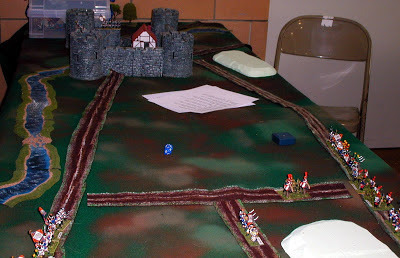 4) I think a fictional set up might be best, with each player bring their own troops where possible (and the others in the group supplying the rest for those who want to play but don't have troops), and considerable leeway for the initial force set up to maximize the "Fog of War" aspects..
5) We may want to plan the next game to run at The Time Machine in Manchester, CT if we can secure the date, resources, and above all enough players to make it all work, ideally with a greater "Fog of War" factor. 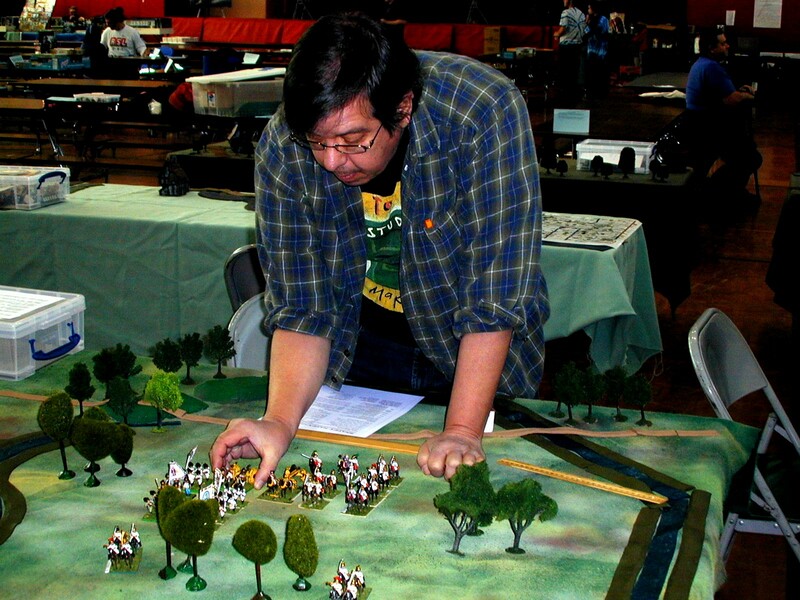 Another option might be the March HAVOC convention in Worchester, MA run by battle Group Boston; that would require something other than their normal tables and time slots, however. 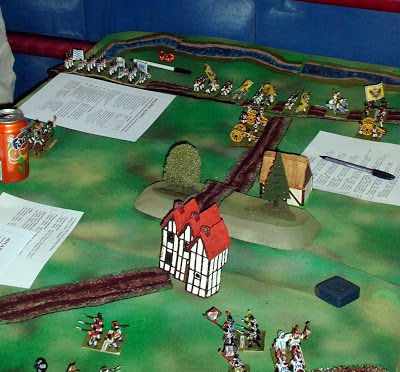 I will say that, even with the other tables in sight, one rapidly gets caught up on the combat on your own table, and is only vaguely aware of the larger picture... of course, THAT will be the job of the C-in-C!